What is the Pyrite Remediation Scheme? The right to access official records held by governmental departments and listed public bodies. The right to have personal information relating to them amended where it is incomplete, incorrect or misleading. The right to be supplied with reasons for decisions made or taken by governmental departments and listed public bodies that affect them. What type of records can be requested under Freedom of Information? Any records relating to you personally, whenever they were created. All other records except “exempt records” which are specified in detail in the Act, e.g. information that may compromise the privacy rights of a third party. As required by the Act, the PRB has produced a reference book to facilitate access to official information held by the PRB by outlining the structure of the organisation, including a description of its functions, powers, duties and services it provides to the public, the classes of records held, and guidelines on how to make a request for information under the FOI Act. The rules and practices of the PRB in relation to any decisions made under the Pyrite Remediation Scheme are also outlined. 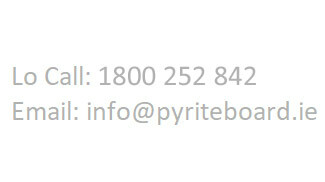 See Pyrite Resolution Board FOI Reference Book Section 15 & 16 in “Documents and Useful Links” on the last page. How do I make an FOI request? A request for information under the Freedom of Information Act must be made in writing and should indicate that the information is being sought under the Freedom of Information Act. The request should also be sufficiently clear for us to identify the records sought. If we are not clear as to the records being sought we will contact you to seek clarification. If you wish to gain access to the records in a particular form (e.g. inspect the records, photocopies, computer disk, etc.) you should specify this in the application. Alternatively, you may download the Freedom of Information Application Form. FOI requests may be submitted by email to info@pyriteboard.ie. or sent by post to FOI Officer, Pyrite Resolution Board, 7 Eastgate Avenue, Little Island, Cork, T45 RX01. Normally you will be notified of the decision on your request within 4 weeks of its receipt. Is there a charge for getting information under the FOI Act? There is no application fee for requests. In respect of non-personal requests, there may be charges for the time spent retrieving records and for any reproduction costs. These will be advised if applicable. Where the cost of search, retrieval and copying is less than €101, no fee is charged. Where the cost of search, retrieval and copying is greater than €500 but less than €700, a maximum charge of €500 applies. Where the cost of search, retrieval and copying is greater than €700, the PRB FOI Unit can refuse to process the request. Details of actual charges relating to your request will be notified to you in writing. There is no charge for submitting a request. Search and Retrieval – €20 per hour (for requests that exceed the €100 minimum in terms of search, retrieval and copying), subject to the ceilings mentioned above. €0.04 per sheet for a photocopy. Internal review fee €30 (€10 for medical card holders). Appeal to the Information Commissioner €50 (€15 for medical card holders). Please go the Information Commissioner’s website for guidance on this appeal and applicable fee. There is no charge if the records concerned contain only personal information relating to the requester, unless there are a significant number of records. If you are claiming a reduced application fee, the request must be accompanied by the Medical Card registration number and your consent to the verification of these details with the Health Service Executive. How is a Freedom of Information request processed by the PRB? The FOI Officer will issue an acknowledgement letter to you within 10 working days (excluding Public Holidays) of your request being received. The next stages of the process will be clearly explained in this letter. A decision regarding your request will normally be issued within 20 working days of the receipt of your request. In some cases, an extension of time may be necessary to complete the decision. If this occurs while processing your request, the FOI Officer will contact you and explain this requirement. Do I need to make an FOI request to get information from the PRB? No. It is not necessary to make an FOI request to get information from the PRB. A considerable amount of material is already made available to the public through the Publications section of this website. Also, queries are routinely handled by phone and via email on info@pyriteboard.ie. FOI provides an additional source of information by facilitating access to records not made routinely available. Can a decision be appealed? Yes. If you would like to appeal the decision made by the FOI Officer, you can do so by sending a request in writing asking for an internal review of the decision to FOI Internal Reviewer, Pyrite Resolution Board, 7 Eastgate Avenue, Little Island, Cork, T45 RX01. An internal review fee of €30 (€10 for medical card holders) is applicable when appealing a decision and this is to be sent with your written submission. The appeal process will involve a full reassessment of your original Freedom of Information request at a more senior level. If, after the internal review, you are unsatisfied with the decision and you would like to appeal again, your appeal should be directed to the Office of the Information Commissioner. This page of our website outlines certain aspects of the FOI Act 2014. By doing this the PRB hopes to assist the public in making an FOI request. These pages are intended as a non-technical guide to certain aspects of the FOI Act 2014. They do not represent a legal interpretation and should not be taken as a definitive representation of anything contained in the FOI Act 2014.